Everything you need to make your Starfinder Game EPIC! * A host of useful and atmospheric locations including: an Abandoned Space Station, Alien storm, Desert Planet, Frozen Moon, Insectoid Hive, a Market Street, Beautiful Nebula and a Spacedock. * and of course... SPACE GOBLINS! That's $140 worth of value for only $89.99! Not sure what Syrinscape even is... watch this! "You don't look like you can afford"
"You'll have to pay extra"
"Show me some real credits"
This SoundSet was imagined, compiled, designed, created, mixed and finished by Chris Koerding for www.syrinscape.com, using existing samples from the Syrinscape server. Starfinder Society Roleplaying Guild Quest "Claim to salvation" © 2017. Paizo Inc., the Paizo golem logo, and Starfinder logo, are trademarks of Paizo Inc. SoundSet © 2017. Sounds created under license with Paizo Inc. Scenario written by Larry Wilhelm. 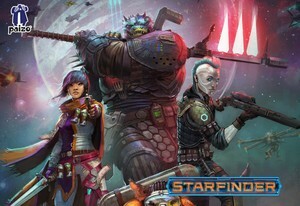 Starfinder Adventure Path: Dead Suns © 2017. Paizo Inc., the Paizo golem logo, Starfinder, and Starfinder Adventure Path are trademarks of Paizo Inc. SoundSet © 2017. Sounds created under license with Paizo Inc.
Starfinder Society Roleplaying Guild Quest "Into the Unknown" © 2017. Paizo Inc., the Paizo golem logo, and Starfinder logo, are trademarks of Paizo Inc. SoundSet © 2017. Sounds created under license with Paizo Inc.